Incredible resource to find apps. 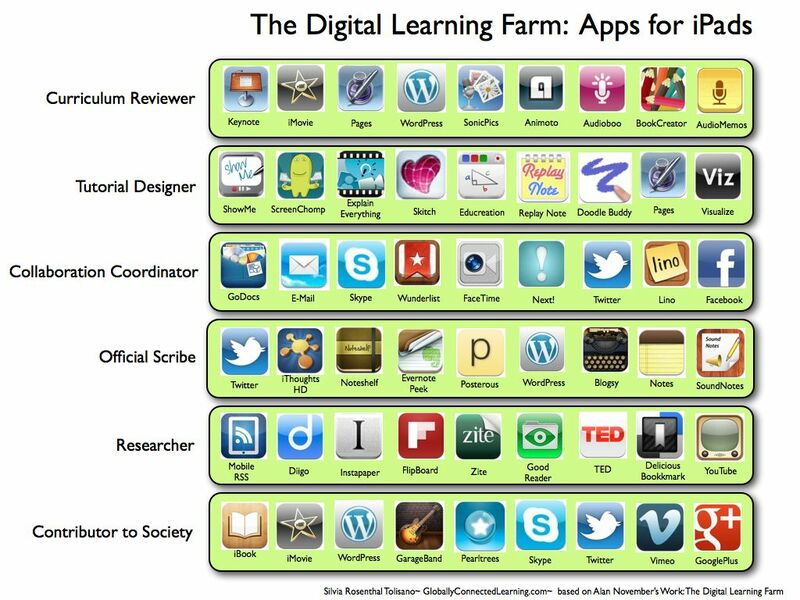 This is from Silvia Tolisano as a digital apps farm for learning. It includes apps, websites, tools. Pretty ubiquitous tools but some specifically ipad/iphone. Larry Ferlazzo can curate some sites. If you are interested in international testing, these are some good sites to review. Microsoft not going for social networking but for educational networking. Before you roll your eyes, the fact is that overlaying educational networks on top of social networks is rife with problems. This is being tested at University of Washington, Syracuse University and New York University. There are many benefits to keeping work and personal separate and educational networks may be a great asset if done right, to the education space. This is a video investigating the use of virtual worlds in schools in the United Kingdom. It goes from college level into younger students. This video and background documents is available. Although second life excitement has died down (particularly with open source alternatives and things like Jibe and Unity platforms that will let you deploy to tablets and gaming environments) the potential is still there. June 2010 video. The part you MUST see is at minute 6 where they are at a jetty where they are taking measurements and preparing to put it into the virtual world. They take pictures and measurements to build a real-life location into the virtual world. This is a phenomenal use of so many cross disciplinary concepts. A screenshot of a teacher's PLN on iGoogle. You can look on the left to see different things included on her pln. Be a new person in 2012: It all starts with you! Why do we kill da green pigs? 10 Ways to be Wonderful: Happy Birthday Kip!